Good things yeah they hardly ever roll around twice. Lyrics, music and recorded by Damian Follett. This is the sixth post in the series on lawyers and marketing. We have previously looked at the product mix, the people who provide your services, how you promoted your services and the place where you render your services. In this next instalment of the examination of the 7 P’s of marketing we have not yet looked at the physical evidence that you use to wrap around your (largely intangible) legal services. This physical evidence is the material part of the services that you render. What do we mean by the physical or material evidence of your services? Your clients will be looking at every physical and visual element of how your approach the market. They will be looking at your office and how it is laid out, how businesslike and professional it is and asking themselves…does it exude the right sense of trust and confidence? The physical environment in which you operate will send out many visual and physical clues as to your practice. They will be looking at your waiting room and consciously or not be wondering if you match their expected price point by the way you have decorated your office combined with your choice of colors, furniture, artwork, magazines and the like. Is there a kid’s play centre or place for an office dog or even an aquarium? How is the space laid out? While functional is always good, people are also looking at how it is organized and what thought has been given to clients who may have to wait. Is there Wi-Fi? Air-conditioning? How are your employees ..and yourself…dressed? Are the chairs and tables comfortable, clean and professional? What is the ambience of your office and in particular your reception area? Is it quiet and respectful? Or do you overhear conversations going on in the office? Is their quiet music playing in the background that provides a soothing atmosphere? You need to ensure that you have matched your ambience with the messages that you want projected about you and your legal services. Where is your office located and what does that say about your services? Is the signage directing people to your office clear and fresh? Do you have a logo and corporate color scheme? Is it reflected on your office stationery, business cards, website and in all other forms of marketing that you employ? This corporate branding is increasingly important today in projecting your image to your clients and others. Speaking of your website, have you had it professionally designed and have you kept it current with regard to recent events, articles and such? Does it render well on mobile devices such as smartphones? Do you have a blog? Have you updated it with new articles on a continual basis? When a client comes in to sign documents, do you provide a folder with your logo and contact information printed on it for the documents, along with a business card, a pen with your logo embossed on it and perhaps a brochure on the firm that speaks to the full range of services that you render? When you send out (by snail mail) copies of documents, articles of interest to clients and the like do you have printed notes with your name and logo on it to which you can write a few words to personalize the delivery of the documents or articles? Does your signature block in your email contain your logo and links to your website and other information (such as a privacy disclaimer)? If you sponsor events, is your logo, business name and color scheme reflected in the sponsorship materials? Think about some other businesses with whom you have recently visited and reflect on these elements. While your services may be intangible, the physical evidence that you wrap around those services can be a strong element in how you market your services. After all you want to get it right since you don’t get a second chance to make a first impression! Lyrics and music by: David Gilmour, Richard Wright and Polly Samson, recorded by Pink Floyd. Garry’s last post on tips.slaw.ca inspired me to write about using dictation on both PCs and Macs. I have been a long-standing fan of voice recognition and the latest versions are even much better than earlier versions. While there is voice recognition built into the Windows operating system, I haven’t seen it used in practice. Rather, I have found that people use DragonDictate for the PC, currently at version 13; or on the Mac, you can use either Dragon for the Mac, Version 4 or use the Dictation & Speech capabilities built into Yosemite. The best thing about the latest version of dictation in Yosemite is that you can download a file and use dictation what are you are on or off-line. This is a significant advantage over prior versions. It’s a matter of fact that this column was “written”, if you can call it that, using Yosemite’s dictation capabilities. Another improvement in dictation in Yosemite is that you can use continuous dictation. Prior versions meant that you could only dictate up to the size of the buffer. It is amazing how easy it is to use and I am referring to both Dragon Dictate for the PC as well as Dictation in Yosemite. I work on both platforms and use voice recognition on both. Garry noted that he does most of his work either on an iPad or Microsoft Surface and barely touches his keyboard. I have to say my experience is much the same (except that I prefer laptops over tablets) and I agree that I am much faster using voice recognition than I am typing. Furthermore, voice recognition never misspells; but it could substitute a synonym or possibly a word recognized in error, in which case you still have to proofread your work. But it is literally amazing to to talk to your computer and see your text appear, correctly transcribed and formatted, on the screen. Now DragonDictate for the PC is much more fully developed then Dictation for the Mac that is part of the OS. However, if all you need is dictation plus some formatting, then dictation for the Mac maybe just fine. I have written extensive papers for conferences using just dictation for the Mac. Why don’t I use DragonDictate for the Mac? Unfortunately, the versions of Dragon that I have, namely versions 2 and 3, are incompatible with Yosemite. I may upgrade but for the moment I’m happy with Dictation in Yosemite. PC users would be delighted with all the additional commands that you get with Dragon for the PC. You can literally browse the web, save your work, apply detailed formatting and do much more by voice commands. Lyrics and music by Michael Reynolds, recorded by Felicia Urquhart. This is a guest post from Chris Green of Greenway Legal Centre in Langley, BC. I have been a fan of Chris’ email newsletter for some time but this post truly struck home for me. It is reproduced here with his kind permission and approval. By the way you can subscribe to Chris’ newsletter by visiting his website. Our November newsletter each year is always a departure from our usually irreverent and light-hearted banter. It is the one edition that we try to play straight, in deference to the solemnity of our topic: saluting the sacrifices made by our veterans in wars past and present. This year is no exception, especially in light of the cowardly murder of a guard of honour on the steps of our National War Memorial. Last year’s piece, Charlie’s Tree, was one of our most read postings ever, and it recently attracted a link to a new YouTube video, “The Black Sedan”. Scroll down to the comments to watch the Jon and Larry’s video and see if you can spot Charlie’s Tree. The tragic events in Ottawa have led to a lot of talk around the water cooler at GreenWay, and interestingly, one of the main themes has been the changing nature of Remembrance Day. Hal commented to me last week, as he completed preparations to lead his youth pipe band to play at the Pitt Meadows Cenotaph, that when he himself had been a young piper in the band, the war still seemed so very real, as his fellow pipers included many veterans of the Second Great War, who treated the annual piping gig at the cenotaph as a personal act of remembrance. Like Hal, my younger life was populated with the veterans of both wars, so those conflicts have always seemed more like current events-like headlines from last week’s newspapers, rather than chapters in a history book. One needed to go no further than the dinner table for anecdotes or reminiscences of the war, and the lives of almost all of the adults in my life had been touched by the war, be they parents, grandparents, teachers, employers or mentors. As the veteran’s numbers decrease, and we contemplate a time in the not too distant future when we mark the passing of the last veteran of WWII, (just as we recently saluted the passing of my namesake Florence Green, who was officially the last known veteran of WWI, when she passed in 2012,) of necessity, the nature of Remembrance Day changes. Increasingly, I think, the day is viewed, at least by younger persons, as an abstract contemplation of the horror of war, or a day to pause and pray for peace. Laudable thoughts for sure, but so very different from putting your elbows on the beer-soaked, terry-towel tablecloth in a smoky Legion hall, in company of those who were actually there, and getting maudlin hoisting a few, to toast those who still live in your memory. And for how much longer will those Legion halls, smoky or not, feature prominently in Remembrance Day celebrations? Sadly, despite the fact that this year will likely see record numbers turning out for the wreath-laying ceremonies, it appears that their days are numbered. Once a mainstay of every small town, Legion halls are quietly disappearing everywhere. No vets to visit them and no money to support them. Last month, while visiting Ucluelet, I glanced down a side street and noticed a boarded up building with a large For Sale sign – it was the Ucluelet Army, Navy and Air Force Veterans Hall. My trip home took me along Hastings Street in Burnaby, where the wrecking ball has now claimed the former home of Branch 148 of the Royal Canadian Legion. Closer to home, I happen to know that the Port Moody City Hall keeps a ‘development package’ under the front counter, touting the virtues of the Clark Street Legion Hall as a great opportunity for re-development, in case any developer drops in to inquire about possible sites. What will Remembrance Day look like, years from now, when there are no veterans of the Great Wars, nor Legion Halls remaining? Until recently, I would have predicted a slow decline – a secular day off with all but a quiet handful of wreath-laying politicians ignoring the meaning of the day, but I think I’ve changed my mind. Consider that, with each year of the Afghanistan conflict, as the casualty list grew, so too did the crowds at Remembrance Day ceremonies. Then, remarkably, came the spontaneous gatherings on the overpasses along the Highway of Heroes, a moving tribute to the fallen warriors returning home, made more powerful because they were impromptu, home-grown and unsanctioned. And then came Cpl. Nathan Cirillo. The spirit of Remembrance, if indeed it had begun to wane, has been re-kindled for another generation. 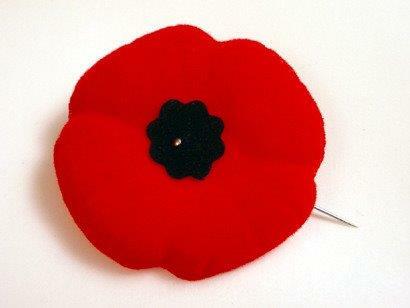 This year, please, join me at the cenotaph. This year, it’s important. Lyrics and Music by Lennon & McCartney recorded by The Beatles. This is a guest post from Ann Mehl and originally appeared in her Newsletter and blog under the title “The High Note“. To say that it struck a note is putting it mildly. I hope you find it to be as moving and reflective as I did. It is reproduced here with her approval and consent. While scanning the radio in my car for a good song, I stumbled upon an interview with Paul McCartney. He was funny and engaging, so I stopped to listen for a while. He was asked about his voice, and if, at age 71, he could still sing all those old Beatles songs. His answer was honest and revealing. “Well,” he said. “I can’t hit all the high notes like I used to, but I’ve probably got better technique now, and you learn ways around that.” Some of those techniques? Changing the melody ever so slightly, letting his back up singers hit the high notes for him, or simply calling upon his audience fill in the blanks. 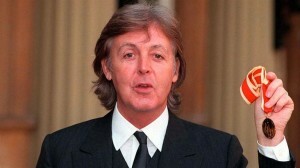 Music legend Sir Paul McCartney has had to learn that even he has musical limitations. This got me thinking: How much of our lives are spent trying to chase a high note that we are no longer capable of hitting? And what does this cost us in terms of health and happiness? In my own life, I know I hit a high note when I ran my first marathon at 3:26, a personal record for me. It’s unlikely I will ever do it again, and that’s okay. I’m interested in different goals now. But it can be very hard to let go of who we used to be, or who we imagine we still are. We see it all the time in professional sports: the athlete who retires, only to “unretire” six months later. The boxer who wants “one more fight” when everyone around him knows he should have quit years ago. Most of us are not athletes or professional performers, but we do know what it’s like to chase our former glories, and to hunger for that intoxicating high note. Maybe it’s the version of ourselves that is 10 years younger, or 20 pounds lighter. Maybe it’s the earlier excitement of a new job, or the rush of a new romance. Most of us yearn for these peak experiences, and once experienced, seek to recreate them. I knew of one serial entrepreneur who made a killing on his first venture, to the tune of almost $10 million. He went on to create several other successful companies after this, but none as big as the first. Measured against this impossible standard, he felt he was constantly failing, even when, by all outward signs he was a massive success. To his family and work colleagues, he had become a bitter pill who could not enjoy his own success. He was enslaved to the high note, in his case, some arbitrary number below which anything spelled failure. He was Sisyphus, compelled to roll an immense boulder uphill, only to become demoralized every time it rolled back down on top of him. There are two basic roads that we can travel: one is the road to freedom, and the other is the road to tyranny. The road to tyranny is based on always hitting the high note, and a refusal to accept anything else. It enslaves us to the past, and blinds us to new opportunities in the present. After all, who are we if we can no longer hit the high note? The road to freedom, on the other hand, accepts that all things are in a constant state of flux: our bodies, our minds, our relationships. What we are able to do in our 20s and 30s is very different from what we can do in our 40s, 50s and beyond. And not only is this okay, it is natural. At the root of all unhappiness is our refusal to accept that all things eventually must end: our youth, our beauty and eventually even ourselves. What we are really fighting against is our own mortality, and that is one battle we will never win. But like Paul McCartney, maybe we can learn some new techniques. We can accept that while a relationship has changed, it does not necessarily have to end. We can accept that while a job is no longer as exciting as it once was, it may offer its own kind of reward in the people we meet. We can accept that through age or infirmity, a parent is no longer the person we once knew, and try to develop a new connection based on who they are now. I’m not suggesting we give up or don’t stretch ourselves, only that we don’t have to be slaves to our past successes (or failures). Graceful surrender to the here and now is always preferable to screeching, or God forbid, ruptured vocal chords. 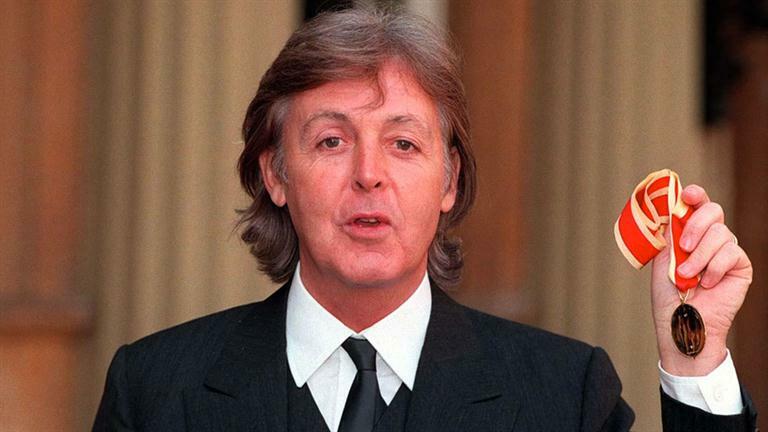 Paul McCartney may not be able to hit the high notes like he used to. All he can do is make friends with the voice he has now, and the many beautiful notes he still can sing. And when the voice cracks, or won’t go where he wants it to go, he invites the audience to sing along. (Hat tip to Stewart Levine for originally drawing my attention to Ann’s article). Thought for the Day: “In the end, the love you take is equal to the love you make” – Paul McCartney.